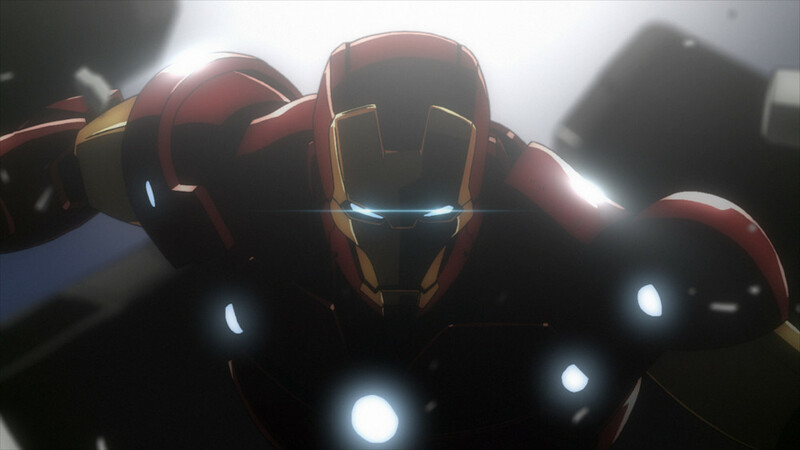 Iron Man: Rise of Technovore is an anime movie made as a follow up of sorts to the 2010 Iron Man anime series. It’s the second time that Marvel and the animation studio Madhouse have teamed up to tackle the golden avenger, but this time with a different writer, director, and team. Having seen and enjoyed the 12-episode anime, I was looking forward to watching this movie. Aside from the music and cast however, no other connection to the series can be found. In fact, they make more connections to the live action franchise than anything else. The story opens with Iron Man (Keiji Fujiwara) and War Machine (Hiroki Yasumoto) goofing around in their armors prior to Tony’s press release concerning his new “Howard” satellite. It’s meant to watch over the entire planet in an effort to protect people from danger, and the media is in an uproar over its potential for invading privacy. Rightfully so. There’s never a clear response for this from Tony unfortunately (I would have liked to hear his defense of it), as the site is attacked by a group of armored goons. They’re in the service of Ezekiel Stane (Miyu Irino), the deranged son of Obadiah Stane, and he’s out to destroy the planet. Why? It’s not really clear. Something about technology…I don’t know. It’s easy to discuss what’s good about this movie because there’s not much. First of all, the animation is quite nice. The characters and their armors all have interesting designs, particularly the shape shifting Technovore armor that Zeke wears. We also get a large variety of Marvel heroes, like War Machine, Black Widow, Nick Fury, Hawkeye, and even the Punisher. That’s right, the Punisher’s in this, too. The action is fast paced and frantic, making the Iron Man armor seem incredibly powerful and advanced. To match this, the original Japanese cast (those from the series reprised their roles) is quite good and sound fitting for the characters. Unfortunately, the rest of the movie can’t back up how nice it looks. The plot is paper thin, and the characters are about half that deep. After seeing quite a few of them now, it’s safe to say that Iron Man stories tend to work the best when they’re about Tony Stark. He’s an incredibly complex and fascinating character to dissect and learn more about. It’s a shame nobody told Brandon Auman, the guy who wrote this story, because Iron Man is just an action stand in here. He’s a cartoon version of the human character most have come to know, stripped down to his bare basics, being bad one liners and plot convenient intelligence. If the plot were at all intriguing, maybe they could get away with this. Perhaps by having an interesting and dangerous villain to make up the difference. No luck here, either. 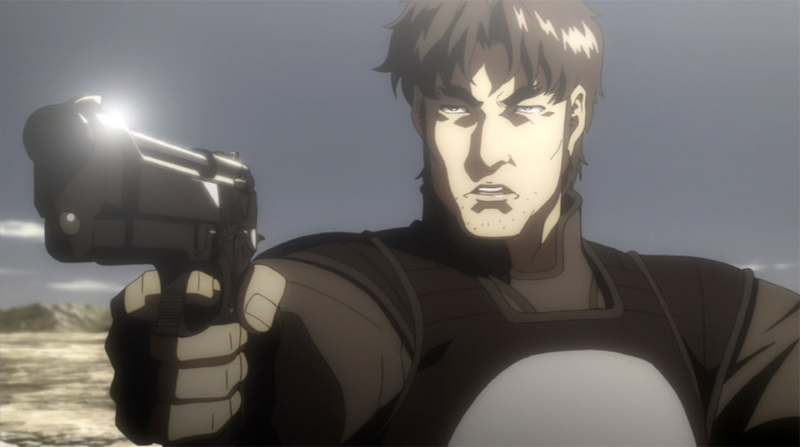 Ezekiel Stane is modified from the comics to be a generic young anime villain, seeking to destroy all mankind for the sake of his vague and lofty ideals. He spews pretentious dialogue devoid of greater meaning, often to a woman that’s never explained. Who was she? Why did she hang around with this creep? I guess we’ll never know. The rest of the cast is just as bland, with Hawkeye (Shuuhei Sakaguchi) and Black Widow (Miyuki Shawashiro) serving as meaningless foils to Iron Man who’s on the run. Why S.H.E.I.L.D. spends so much time and money trying to bring in Iron Man is beyond me. It’s a flimsy excuse for more mind numbing action scenes that don’t need to be there. If they would have just helped Iron Man find the bad guys instead of impeding his progress at every turn, the movie would have been over twice as fast. The time wasted on these would have been better served developing the characters; getting them invested in what’s going on. Maybe they could have found something substantial for War Machine to do, instead of removing him from the majority of the movie. Or giving a better excuse for Iron Man and the Punisher, two characters on pretty opposite sides of the superhero spectrum, to team up. This is probably wishful thinking on my part, because the awkward script prevents the dialogue from making any of these characters matter. Iron Man: Rise of Technovore is a mediocre and generic foray into anime that had me wanting to just go back and watch the far superior show. Despite the nice animation, its visual success is dwarfed by the simplistic and uninteresting plot, wooden dialogue, bland villain, and excessive action. November 1, 2013 by Ariel Shavonne.